The pet friendly shelter will open Friday, 10 a.m. at West Boynton Recreation Center, 6000 Northtree Blvd., Lake Worth. 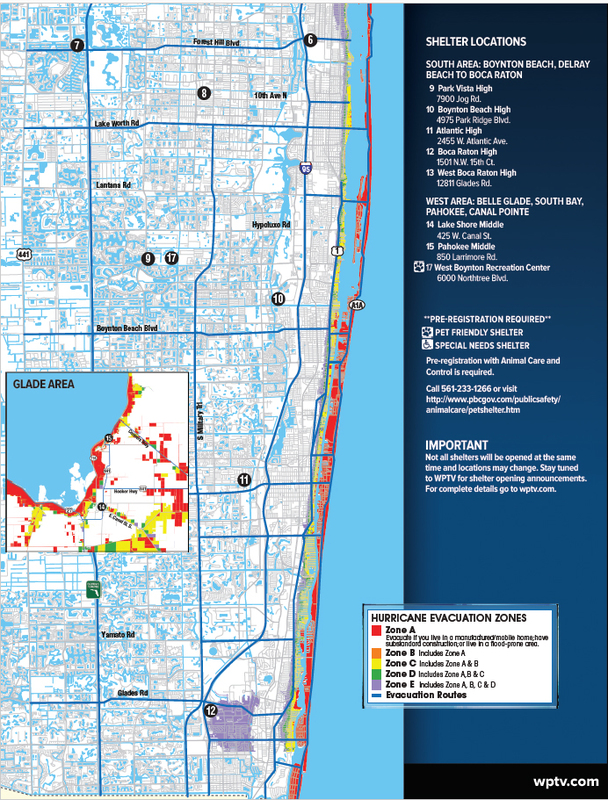 This shelter will be available to Palm Beach County residents residing in a mandatory evacuation zone or in mobile homes. Proof of residency is required. Space is limited and restrictions apply. Each pet must be accompanied by only one owner who will stay at the shelter. Other family members will need to stay at nearby Park Vista High School due to space restrictions. Livestock and reptiles will not be accepted. Pets will be housed in a separate area from people. Pet owners will be given a schedule to attend to their animal’s needs. Please visit www.pbcgov.com/animal to register. A special needs shelter will open Friday at the South Florida Fairgrounds. If you are registered you should have received notification. People with special medical needs should register for our Special Needs Program by calling (561) 712-6400 or visiting www.readypbc.org . * Westwood High School, 1801 Angle Road, Fort Pierce, which will also serve as a pet-friendly shelter. Residents need to bring crates for their pets, as well as food, water and litter. All pets must have up-to-date vaccinations. Pets, along with their owners, will be taken on a first-come, first-serve basis. * Treasure Coast High School, 1000 SW Darwin Blvd. Port St. Lucie. * Westgate K-8 School, 1050 NE Cashmere Blvd., Port St. Lucie. * Fort Pierce Central High School, 4101 South 25th Street, Fort Pierce. Lakewood Park Elementary, 7800 Indrio Road, Fort Pierce. Morningside Elementary, 2300 SE Gowin Dr, Port St Lucie. Oak Hammock Elementary, 1251 SW California Blvd, Port St Lucie. Parkway Elementary School, 7000 NW Selvitz Rd, Port St Lucie. Samuel S. Gaines Academy, 2250 S Jenkins Rd, Fort Pierce. Residents are reminded that shelters are places of last resort. Those planning to stay at a shelter should bring food, water, blankets, pillows and medications. 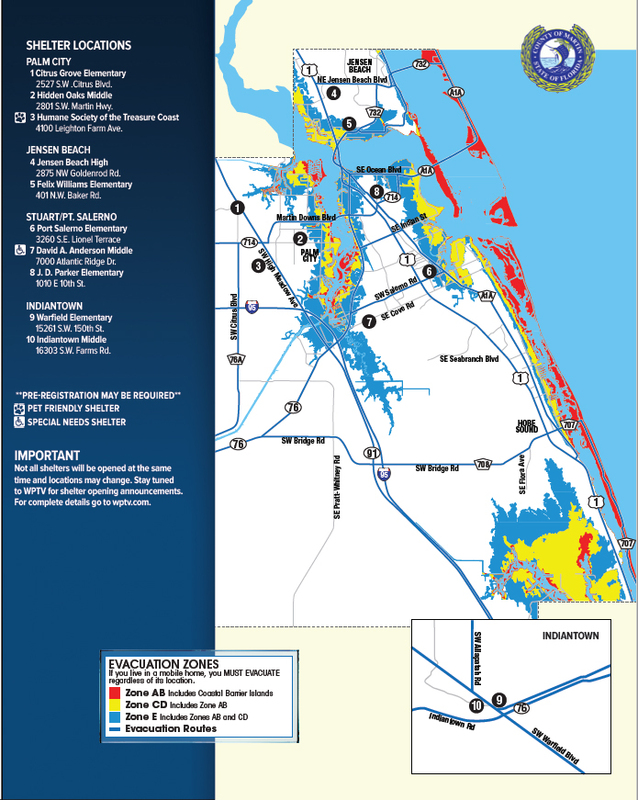 Barrier Island Re-Entry Program: With all county offices closed, the last chance for residents to get a barrier island re-entry placard is from 9 am to noon Thursday at the Fire Station #8 on SOUTH HUTCHINSON ISLAND near Jensen Beach, 7583 S. Ocean Drive (A1A). To receive this placard, each resident must produce two forms of proof that they reside on the barrier island such as a utility bill with a local address along with a local driver’s license. One placard is issued for each household. Emergency shelters will open at 8 a.m. on Saturday, Sept. 9 for affected residents. 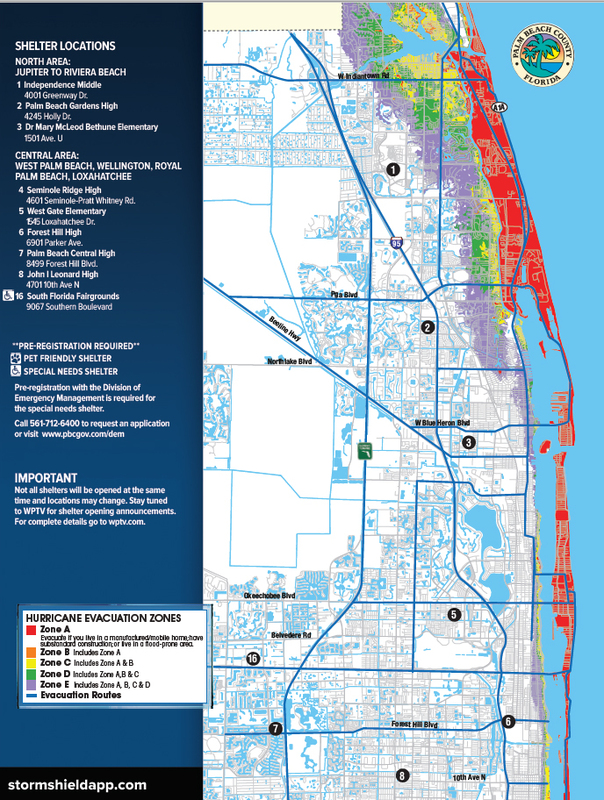 Residents are encouraged to consider other sheltering options before deciding to go to an emergency shelter. Martin County is working with its partners to begin activation of Anderson Middle School in Stuart as a Special Needs Shelter.The Special Needs Shelter includes limited medical oversight and is designed for residents with electricity-dependent needs such as oxygen, as well as the need for evacuation transportation to and from the shelter. Pre-registration is required and may still be done online at www.martin.fl.us/specialneeds . Residents who come to the shelter and do not meet the requirements will be re-directed to another shelter suitable for their needs. Specific details will be shared as soon as they become available. Currently there are no Red Cross shelters open in Martin County. Pets (other than service animals) are not allowed in Red Cross shelters, however the Humane Society of the Treasure Coast currently has availability to shelter pets should evacuations be ordered. Residents who wish to take advantage of this service may register online at hstc1.org/disaster or in person at 4100 SW Leighton Farm Ave. in Palm City. Martin County's Public Information Line is active and staff is available between 8 a.m. and 6 p.m. Residents can call 772-287-1652 to have their storm-related questions answered. 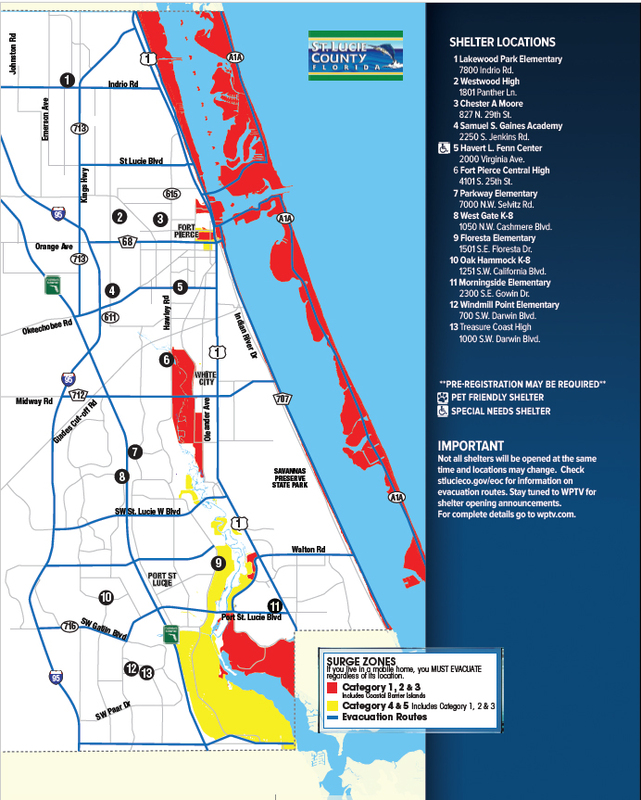 Indian River County shelters include Freshmen Learning Center, Oslo Middle School, Sebastian River Middle School, Fellsmere Elementary, and Liberty Magnet (which is a pet-friendly shelter). A special needs shelter will be opened at Treasure Coast Elementary. You need to register for this shelter by calling 772-226-3930. All of the Indian River County shelters will open Saturday at 8 a.m.
Information on shelter openings in other counties will be added as it becomes available. The shelter map for Okeechobee county are below.